Comparisons to TFiOS are understandable, but I'm not seeing it all the way aside from themes and the condemnation of treating those who are sick like they're less-than-human. TFiOS is the romantic and philosophical heartbreaking one, SUTHY is the foul-mouthed one that wants to go out with one last hurrah. 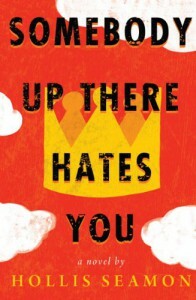 Obviously the John Green title is the superior book, but that isn't to say that this one isn't worth a look too. Part of it is so interesting because Richie and Sylvie are characters who aren't remotely easy-to-like much of the time, and wow, the stupid mistakes they make are immense. The romance here is significantly less romantic than that of Hazel and Gus, partially because it's told from a male point of view and feels more like lust and infatuation than real love. (This might sound horrible to say considering the kids are, you know, dying, but still.) But it's still sweet and it's hard not to hope for the best even knowing the inevitable. Also, it's really funny in some parts. I wish there wasn't perhaps so much focus on a certain three-letter word, but that is important to many teenagers so it's not a fatal flaw to me. And, wow, Sylvie's father is by no means the kind of character I expected to root for in the end... really, the emotion of the last chapter was much more than I expected at the beginning. The book's surprising flashes of emotion in the midst of all the comedy and crudeness are what ultimately make it a worthwhile read to me.